I’ve never paid too much attention to IPv6, except for turning it off completely in case of strange issues. And admit it, most of you do the same. Security is getting more and more important, and as a messaging consultant you want your Exchange environment top notch. In the Dutch community NGN I was pointed to internet.nl where you can check your presence on the Internet. Lots of red crosses when it comes to messaging and IPv6, reason for me to start looking into that. In this blogpost I will focus on the Exchange 2016 Edge Transport server (I have two for inbound and outbound email) and the Exchange 2016 Mailbox server, which is load balanced behind a Kemp LoadMaster LM3600. Although a lot of Exchange admins disable IPv6 on their Exchange servers (through a registry key) in case of strange issues, it is not a recommended solution. I have two Exchange 2016 Mailbox servers, one Exchange 2013 multi-role server and two Edge Transport servers (one Exchange 2013 and the other Exchange 2016) for inbound and outbound SMTP traffic. There are two MX records which point to these Edge Transport servers. Both have an external IPv4 address. The first step of course is to add an IPv6 address to the network adapter of the Edge Transport servers, your provider should be able to supply you with a sufficient IP range. This should not result in too much issues. 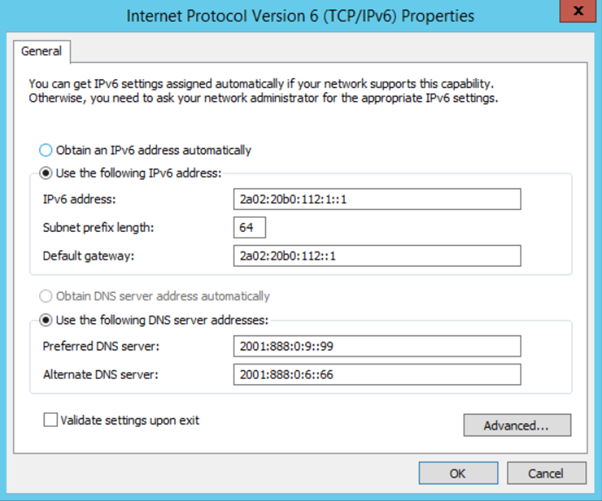 If you want to ping your server on IPv6 make sure that the File and Printer Sharing (Echo request – ICMPv6-In) inbound rule is enabled in Windows Firewall. The next step is to enable the Edge Transport server for IPv6 usage. The Mailbox server has everything setup by default, but the Edge Transport server is only configured for IPv4. In my previous blogpost I discussed Azure AD Connect Pass-Through Authentication (PTA), how it works and how it can be configured. In that blogpost I did not enable Single Sign-On (SSO) and that was also the first comment I got, within one or two days. Enabling SSO and how it works it this blogpost’s topic. I already explained the authentication flow when using PTA. 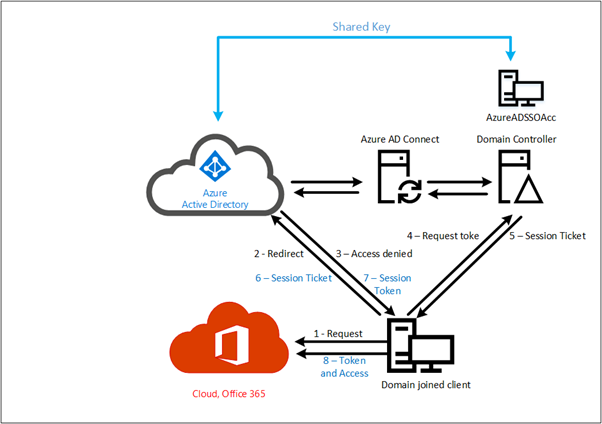 When accessing a service in Office 365 you are redirected to Azure AD, you enter your credentials and the credentials are placed in the Azure Service Bus. The Azure AD Connect server retrieves these credentials from the Service Bus and presents them to the on-premises Domain Controller. The result is returned to the service bus and you’re granted access, or denied when something is wrong of course. Note. I skipped most of the configuration steps since this is identical to the configuration steps in the previous blogpost. During the Azure AD Connect wizard you also must enter your on-premises administrator credentials, these are needed to configure your on-premises Active Directory to enable SSO with PTA. When you are on a domain joined workstation that has access to a Domain Controller, you only have to select the appropriate user account. The password is automatically returned to Azure AD and if all is well you are granted access to Outlook Web App. If you don’t want to select or enter a logon name you can also use domain hints. In combination with Outlook Web App you would use a URL like https://outlook.office.com/owa/contoso.com. If you do so your current credentials (again, on a domain joined workstation that has access to a Domain Controller) are automatically passed through and you are granted access. But how does this sSSO actually work under the hood. 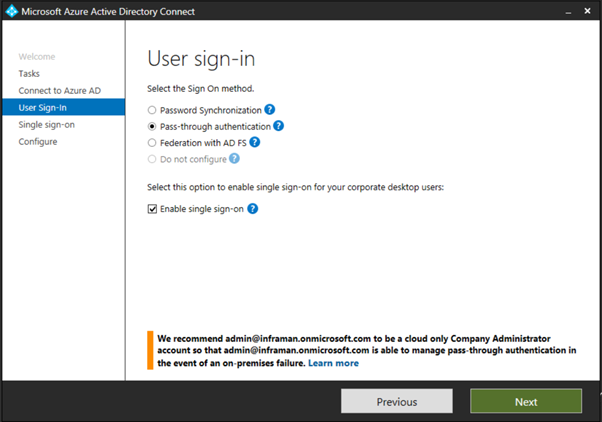 When enabling SSO in the Azure AD Connect wizard you have to enter your on-premises domain administrator account. This is used to create an additional computer object in Active Directory called AZUREADSSOACC. This computer account is used to create a shared Kerberos key between your on-premises Active Directory and Azure Active Directory, needed for creating the sSSO experience. The client accesses a service in the Microsoft cloud, for example OWA via https://outlook.office.com/owa. The request is redirected from Office 365 to Azure Active Directory. Access is denied, and a 401 error is returned to the client. The client accesses a local Domain Controller and requests a Kerberos token. A Kerberos session ticket is returned to the client. The session ticket is presented to Azure Active Directory. Since Azure Active Directory has a shared ticket with your on-premises Active Directory is can generate a Kerberos token for the client to use. The Kerberos token is presented to Office 365 and access is granted. The user can now start using OWA. As you can see this only works for domain joined clients that have access to a local Domain Controller. If they don’t have access to a local Domain Controller the regular PTA process as shown in the beginning of this blogpost (and previous blogpost) is followed. Tip. Use GPO to change this for all clients in your network. 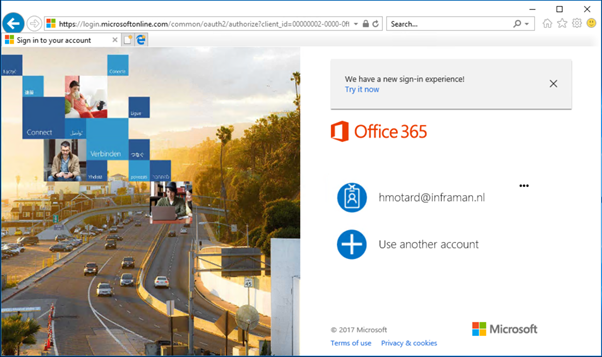 If you use a domain hint in your URL like https://outlook.office.com/owa/inframan.nl, then the account is automatically logged on. One small but strange note, this is supported by Microsoft Internet Explorer, but not by the Microsoft Edge browser (at least not at the moment of writing, early November 2017). This might change in the future though. Next time you start Outlook you will see that it will automatically logon to Exchange Online (whereas it didn’t when Oauth was not enabled). You can use Pass-through authentication if you have a requirement to keep all user passwords on-premises (and thus not store them in the Microsoft cloud). When using Pass-through authentication you can also enable seamless Single-Sign On or sSSO. This way domain joined clients (that have access to a Domain Controller) can use Kerberos authentication to access services in the Microsoft cloud. A number of issues to be aware of: not all clients do support PTA or sSSO as outlined in this article. For example, Internet Explorer does support it, but the Edge browser doesn’t. Outlook 2013/2016 do support it (modern authentication) but Outlook 2010 does not. Also, the Lync/Skype for business clients do not support this at all. I expect this to change in the (near) future, and when it does I will update this article.